It might seem obvious that a bare minimum of Microsoft Office skills is required to function properly in an organization. However, just the basics is not enough in today’s digitally disrupted world. Microsoft Office is now an integrated experience between apps that all serve a single purpose: to focus the company’s collaboration and communication efforts under a single platform. Just learning the basic integration among these tools will give you a huge boost in the interview. We live in a fast-paced world but at the same time we need a breathing room of ideas. We are at a time where creativity and soft skills are now far more important than ever. With that said, there’s also the reality that organizations and businesses are in a race, putting great pressure on employees. 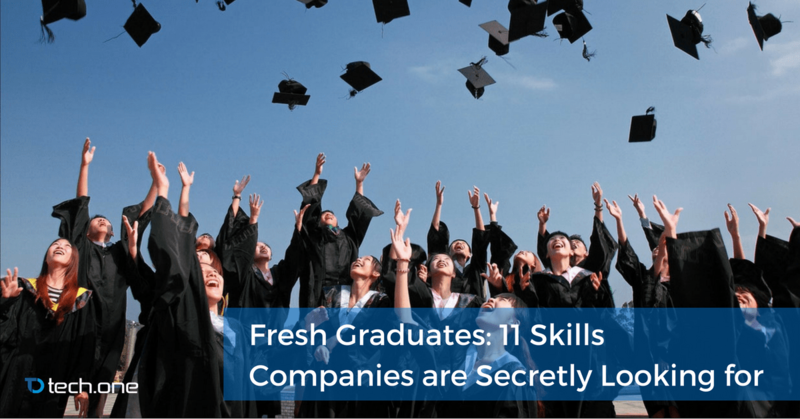 Fresh graduates should learn how to hone creativity and handle pressure. Finding a balance between these two will prove to be one of the greatest assets in a digitally disrupted world. A decade ago, the rise of BPO industries paved the way for talents interacting with a global audience. Nowadays, industries are taking it to the next level by introducing collaboration throughout the whole company on a global scale with tools like Microsoft Teams under Office 365. Adapting fast is key in this aspect as your workmates are no longer limited by local, language, or even culture. Nowadays, basic coding skills or at least a decent grasp of it is almost essential for any fresh graduate aiming to work for modern corporations. Many tools and platforms nowadays are deployed digitally and a bit of knowledge on the concept of coding and programming would prove invaluable. Thankfully, you don’t have to spend too much to get the basics A good video or two will probably be enough to at least scrape the surface. If you want to take it further, Tech One Global, a leading solutions integrator, is offering a basic course! More details will be revealed in the future. You can finally put the hours you’ve spent on Twitter to good use. Organizations nowadays often utilize social and digital platforms not only for marketing but also for research, collaboration, and networking. Being comfortable in the world wide web is essential, plus points if you involve yourself in online communities and have a bit of knowledge on the “language” of the internet. Another coincidental benefit of staying too much on the internet. Being at home with technology especially mobile phones is now a huge advantage in the workplace. With mobile adoption rates rising higher every minute and many companies opting for mobile options on their apps and platforms, being at home with using your phone for work will be a key trait in the coming disruptions. Back then there’s your extracurricular organizations. Nowadays, the world is virtually open when it comes to communities. Involving yourself in different internet communities like forum boards, social media groups, and chat channels is now a boon in our fast-paced world. Big tech companies like Microsoft and gaming giants like Blizzard even support their own boards and often visit Reddit to engage in simple AMAs. Even Blockchain, one of the rising technology nowadays, primarily focuses on communities for their projects. Communities are the primary source of the hottest news and insights, use them to their full potential and you can be sure that you’ll see every innovation that will come your way. Nope we are not kidding. Bill Gates even said that he will always “hire the lazy person to do a hard job” with the justification that the lazy person will find an easier way to do the hard job. This is often true especially with industries that focus on developing QOL applications. Find a balance between creative solutions and workload management. The greatest innovations come from the need to find an easier way after all. Work smart, have that passion to innovate. That’ll bring you to greater heights in your career. It’s no longer enough that a company’s solution is the cheapest and most effective. Consumers nowadays have many options and the definition of value is getting blurry minute by minute. This is where empathy comes in. A good employee knows the pain points to address just by talking to a person, this ability is very useful not only for the company but for your co-workers as well. Remember, your clients and officemates are and will always be humans (or in Tech One Global’s case, puppies. We love puppies in the office). Organizations are dynamic. One moment you’re doing work in the office, the next moment you’re on your laptop on the way to the airport. Fresh grads should frame their minds to work no matter what the environment is because it’s highly likely that you will be traveling a lot. Given how interconnected the whole world is now, you might find yourself booking a flight to Japan just to attend a business meeting. Thankfully, this is exactly what Microsoft is addressing. With powerful security and collaboration tool M365 (Microsoft 365) , you can have office anytime, anywhere. If you’re school still has not invested in it, drop in that suggestion and empower your organization to develop future-ready graduates. Your professors might tell you to keep honing yourself even outside school. We say that it’s not enough. You must put your knowledge into taking risks. Knowledge not utilized will stay stagnant. Enter safe and calculated risks in your career whether it’s taking up a certification or exploring a new emerging technology. Shape yourself as an employee and a person that craves knowledge and the thrill of risks, not because of the rewards, but because it’s in your nature. This mindset is what separates winners and losers in the digital curve. There will always be losers with innovations, don’t be one of them. To keep yourself updated just stay tuned to Tech One Global. We’re here to guide you.